Welcome Home Series handlesets are the perfect addition to your front door to create a unique and fashionable entryway to your home. Each is stylishly designed to provide maximum-security protection. There are many styles, finishes and configurations from which to choose. Exquisite design combined with a distinctive profile, the Troy knob executes strength and beauty This privacy knob/lever is best used in interior bed and bath applications where privacy is required. Both knobs/levers are locked or unlocked by turn button inside. The outside knob/lever can be unlocked by an emergency key. The crisp, clean appearance of the Satin Nickel finish adds to the overall look of the product and brings a modern feel. Baldwin has a 60 year legacy of craftsmanship and innovation. Rated #1 in quality by builders and contractors, Baldwin is pleased to offer a line of luxury hardware for the discriminating consumer, our Prestige Series. Feel the difference - Baldwin hardware is solid throughout. With a 60 year legacy of superior style and quality, Baldwin is the choice for an elegant and secure presence. The refined styling of the Wesley handle set is characterized by intricate arches accented with layers of bevelling. The classic round shape and intricate lines of the Alcott knob complement and enhance a variety of design styles. The crisp, clean appearance of the Satin nickel finish adds to the overall look of the product and brings a modern feel. The single cylinder deadbolt can be locked or unlocked by a key on the outside, or the turn button on the inside. SmartKey Re-key Technology allows you to control who has access to your home. Inspired by modern design elements, the Quatrefoil back plate works with any cabinet knob. The oversized design makes a bold statement to your cabinets and also works well to cover any imperfections or old holes in your cabinetry. This design is equally beautiful on both cabinetry and furniture. Baldwin has a 60 year legacy of craftsmanship and innovation. Rated #1 in quality by builders and contractors, Baldwin is pleased to offer a line of luxury hardware for the discriminating consumer, our Prestige Series. Feel the difference - Baldwin hardware is solid throughout. With a 60 year legacy of superior style and quality, Baldwin is the choice for an elegant and secure presence. The classic round shape and intricate lines of the Alcott knob complement and enhance a variety of design styles. The Polished Brass finish adds to the traditional look and feel of the product and makes a classic statement. This passage knob/lever is best used in interior hall and closet applications where no locking is required. The lever is reversible and mounts on both left and right handed doors. 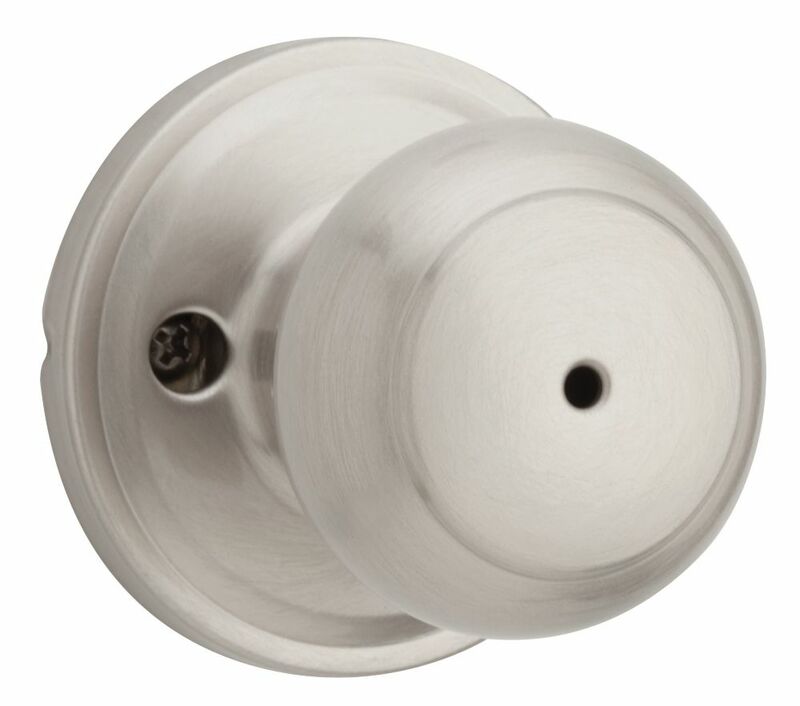 Troy Satin Nickel Privacy Knob Welcome Home Series handlesets are the perfect addition to your front door to create a unique and fashionable entryway to your home. Each is stylishly designed to provide maximum-security protection. There are many styles, finishes and configurations from which to choose. Exquisite design combined with a distinctive profile, the Troy knob executes strength and beauty This privacy knob/lever is best used in interior bed and bath applications where privacy is required. Both knobs/levers are locked or unlocked by turn button inside. The outside knob/lever can be unlocked by an emergency key. The crisp, clean appearance of the Satin Nickel finish adds to the overall look of the product and brings a modern feel.